In The Nature of Life (1948). Sed tamen salis petrae. VI. Part V. NOV. CORVLI. ET V. sulphuris, et sic facies toniitrum et coruscationem: sic facies artificium. But, however, of saltpetre take six parts, live of young willow (charcoal), and five of sulphur, and so you will make thunder and lightning, and so you will turn the trick. Bacon’s recipe for Gunpowder, partly expressed as an anagram in the original Latin. Roger Bacon's Letter Concerning the Marvelous Power of Art and of Nature and Concerning the Nullity of Magic, trans. T. L. Davis (1922), 48. A catalyst is a substance which alters the velocity of a chemical reaction without appearing in the final products. 'Über Katalyse', Zeitschrift für Physikalische Chemie (1901), 7, 995-1004 as quoted in J. R. Partington, A History of Chemistry, Vol. 4 (1901), 599-600. 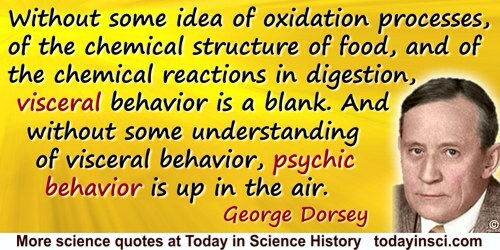 All life depends on organic reactions. Quoted in William J. Cromie, Obituary, Harvard University Gazette (16 Oct 1997). An honest man, armed with all the knowledge available to us now, could only state that in some sense, the origin of life appears at the moment to be almost a miracle, so many are the conditions which would have had to have been satisfied to get it going. But this should not be taken to imply that there are good reasons to believe that it could not have started on the earth by a perfectly reasonable sequence of fairly ordinary chemical reactions. The plain fact is that the time available was too long, the many microenvironments on the earth's surface too diverse, the various chemical possibilities too numerous and our own knowledge and imagination too feeble to allow us to be able to unravel exactly how it might or might not have happened such a long time ago, especially as we have no experimental evidence from that era to check our ideas against. In Life Itself: Its Origin and Nature (1981), 88. And by the influence of heat, light, and electrical powers, there is a constant series of changes [in animal and vegetal substances]; matter assumes new forms, the destruction of one order of beings tends to the conservation of another, solution and consolidation, decay and renovation, are connected, and whilst the parts of the system, continue in a state of fluctuation and change, the order and harmony of the whole remain unalterable. The Elements of Agricultural Chemistry (1813), in J. Davy (ed.) The Collected Works of Sir Humphry Davy(1839-40), Vol 7, 182. Finally I got to carbon, and as you all know, in the case of carbon the reaction works out beautifully. One goes through six reactions, and at the end one comes back to carbon. In the process one has made four hydrogen atoms into one of helium. The theory, of course, was not made on the railway train from Washington to Ithaca … It didn’t take very long, it took about six weeks, but not even the Trans-Siberian railroad [has] taken that long for its journey. 'Pleasure from Physics', From A Life of Physics: Evening Lectures at the International Centre for Theoretical Physics, Trieste, Italy. A Special Supplement of the IAEA Bulletin (1968), 14. For more than ten years, my theory was in limbo. Then, finally, in the late 1980s, physicists at Princeton said, “There’s nothing wrong with this theory. It’s the only one that works, and we have to open out minds to hyperspace.” We weren’t destined to discover this theory for another 100 years because it’s so bizarre, so different from everything we’d been doing. We didn’t use the normal sequence of discoveries to get to it. Describing reaction to his superstring theory of hyperspace which mathematically relates the universe’s basic forces. I read in the proof sheets of Hardy on Ramanujan: “As someone said, each of the positive integers was one of his personal friends.” My reaction was, “I wonder who said that; I wish I had.” In the next proof-sheets I read (what now stands), “It was Littlewood who said…”. What had happened was that Hardy had received the remark in silence and with poker face, and I wrote it off as a dud. In Béla Bollobás (ed. ), Littlewood’s Miscellany, (1986), 61. I think it would be just to say the most essential characteristic of mind is memory, using this word in its broadest sense to include every influence of past experience on present reactions. In Portraits from Memory: and Other Essays (1956), 143. I will now direct the attention of scientists to a previously unnoticed cause which brings about the metamorphosis and decomposition phenomena which are usually called decay, putrefaction, rotting, fermentation and moldering. This cause is the ability possessed by a body engaged in decomposition or combination, i.e. in chemical action, to give rise in a body in contact with it the same ability to undergo the same change which it experiences itself. Annalen der Pharmacie 1839, 30, 262. Trans. W. H. Brock. In Basin and Range (1981), 135. In deriving a body from the water type I intend to express that to this body, considered as an oxide, there corresponds a chloride, a bromide, a sulphide, a nitride, etc., susceptible of double compositions, or resulting from double decompositions, analogous to those presented by hydrochloric acid, hydrobromic acid, sulphuretted hydrogen, ammonia etc., or which give rise to the same compounds. The type is thus the unit of comparison for all the bodies which, like it, are susceptible of similar changes or result from similar changes. Traité de Chimie Organique, 1856, 4, 587. Trans. J. R. Partington, A History of Chemistry, (1970), Vol. 4, 456. In every combustion there is disengagement of the matter of fire or of light. A body can burn only in pure air [oxygen]. There is no destruction or decomposition of pure air and the increase in weight of the body burnt is exactly equal to the weight of air destroyed or decomposed. The body burnt changes into an acid by addition of the substance that increases its weight. Pure air is a compound of the matter of fire or of light with a base. In combustion the burning body removes the base, which it attracts more strongly than does the matter of heat, which appears as flame, heat and light. 'Memoire sur la combustion en général', Mémoires de l'Académie des Sciences, 1777, 592. Reprinted in Oeuvres de Lavoisier (1864), Vol. 2, 225-33, trans. M. P. Crosland. It is evident that certain genes which either initially or ultimately have beneficial effects may at the same time produce characters of a non-adaptive type, which will therefore be established with them. Such characters may sometimes serve most easily to distinguish different races or species; indeed, they may be the only ones ordinarily available, when the advantages with which they are associated are of a physiological nature. Further, it may happen that the chain of reactions which a gene sets going is of advantage, while the end-product to which this gives rise, say a character in a juvenile or the adult stage, is of no adaptive significance. Mendelism and Evolution (1931), 78-9. It was a reaction from the old idea of protoplasm, a name which was a mere repository of ignorance. It was a reaction from the old idea of “protoplasm”, a name which was a mere repository of ignorance. Perspectives in Biochemistry (1938). As cited in Max Perutz, I Wish I’d Made You Angry Earlier: Essays on Science, Scientists, and Humanity (1998). My position is perfectly definite. Gravitation, motion, heat, light, electricity and chemical action are one and the same object in various forms of manifestation. Annalen der Chemie und der Pharmacie (1842). Trans. A. S. Eve and C. H. Creasey, The Life and Work of John Tyndall (1945), 94. Oeuvres (1862), Vol. 2, 550-1. Trans. John Heilbron, Weighing Imponderables and Other Quantitative Science around 1800 (1993), 14. Seeing is an experience. A retinal reaction is only a physical state... People, not their eyes, see. Cameras, and eye-balls, are blind... there is more to seeing than meets the eyeball. Patterns of Discovery (1958), 6-7. Since it is proposed to regard chemical reactions as electrical transactions in which reagents act by reason of a constitutional affinity either for electrons or for atomic nuclei, it is important to be able to recognize which type of reactivity any given reagent exhibits. 'Principles of an Electronic Theory of Organic Reactions', Chemical Reviews (1934), 15, 265. So many of the chemical reactions occurring in living systems have been shown to be catalytic processes occurring isothermally on the surface of specific proteins, referred to as enzymes, that it seems fairly safe to assume that all are of this nature and that the proteins are the necessary basis for carrying out the processes that we call life. In 'The Physical Basis of Life', (1951), 39. As given in Andrew Brown, J.D. Bernal: The Sage of Science (2005), 359. 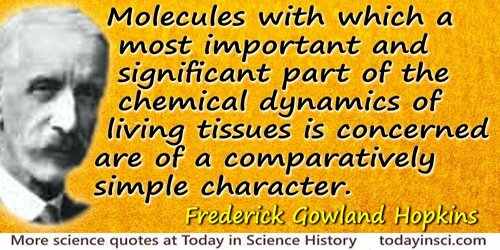 Quoted in Joseph Stewart Fruton Proteins, Enzymes, Genes: The Interplay of Chemistry and Biology (1999), 240. The Principia: Mathematical Principles of Natural Philosophy (1687), 3rd edition (1726), trans. I. Bernard Cohen and Anne Whitman (1999), Axioms, or Laws of Motion, Law 3, 417. To solve a problem is to create new problems, new knowledge immediately reveals new areas of ignorance, and the need for new experiments. At least, in the field of fast reactions, the experiments do not take very long to perform. From Nobel Lecture (11 Dec 1967), 'Flash Photolysis and Some of its Applications.' 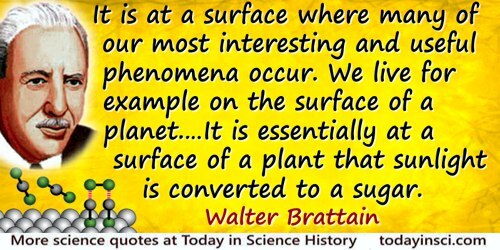 In Nobel Lectures: Chemistry 1963-1970 (1972), 261.